On the slopes of Etna Volcano, at 650 meters above sea level, totally immersed in nature and the green, Il Picciolo Etna Golf Resort & Spa is perfect for those who want a relaxing holiday. Thanks to its position, from here you can start pleasant excursions to discover the beautiful landscape of Mount Etna with its vineyards, orchards and typical Mediterranean vegetation. The town of Taormina is only 25 km, and in the surrounding area you can visit the Park of Etna, the Nebrodi Park and the Parco Fluviale dell’Alcantara. Catania-Fontanarossa Airport is approx. 69 km away. 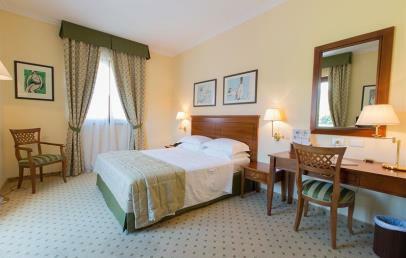 IL Picciolo Etna Golf Resort & Spa is composed by 98 spacious rooms and is located close to the 18-hole golf course Il Picciolo Golf Club, that provided also of a driving range and that has an external management. Here you can enjoy pleasant relaxing holidays in contact with nature. During the summer guests can enjoy an outdoor pool surrounded by green. 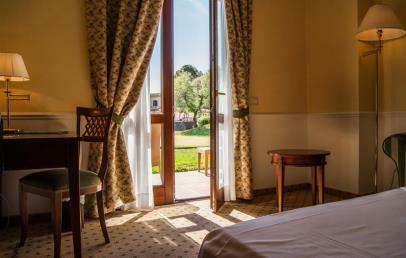 From the 98 rooms and suites of the Il Picciolo Etna Golf Resort & Spa you can enjoy a magnificent view over the vineyards, orchards and forests that climb towards Mount Etna and that surround the hotel. The rooms are furnished in a sober style and all have air conditioning, hairdryer, satellite TV, minibar, safety box, internet connection, wake-up service and desk. To regenerate and recharge the batteries, then you can book treatments at the beautiful and well-equipped health club, spread over a surface of 950 sq.m. offering sauna, Turkish bath, fitness room, hydro massage and treatment for face and body. Guests can also relax in the indoor and outdoor pools. The access to the spa pool is only possible for guests over 16 years. Not far from the hotel is Il Pìcciolo Golf Club, an 18-hole course located in an enchanting scenery made of woods, oaks, hazel trees and vineyards. It's the first golf course built in Sicily in 1989 by the architect Luigi Rota Caremoli; it is a par 72 with 5870 meters in length which also offers a driving range, putting and pitching greens. The restaurant "La Ghiandaia" of Il Picciolo Etna Golf Resort & Spa offers the guests the opportunity to make a journey through taste and time. The dishes prepared by the chef are a mix among seasonal ingredients and elements of the international cuisine. The outdoor spaces are an enchanting natural scenery to enjoy summer days. The Birdie Bar offer refreshing cocktails and snacks, both in the internal rooms and in the terrace. 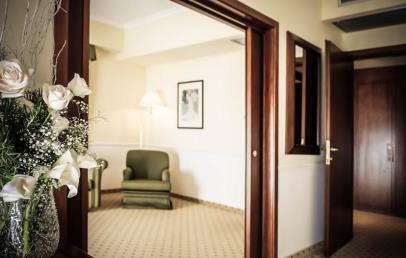 Among the various services, Il Picciolo Etna Golf Resort & Spa provides guests with: Club House, Spa, internal and external swimming pool, fitness room, restaurant, bar, 6 meeting rooms, parking. Nearby it is possible to practice several activites as trekking, free-climbing, mountain biking, horse riding, quad tours, jeep tours, river trekking, rafting, canyoning, skiing (winter), gastronomic and wine tours. 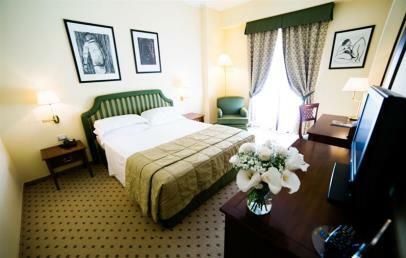 Comfortable double room, traditionally furnished and equipped with all comforts with an useful desk and internet connection (LAN and Wi-Fi). 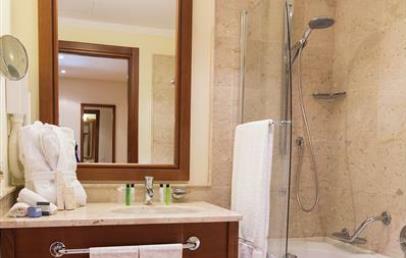 The bathroom has shower or bathtub and hairdryer. 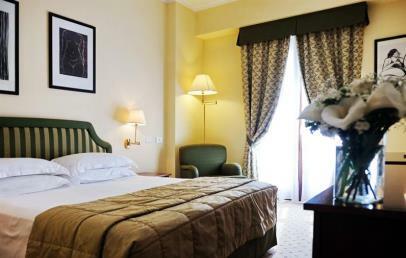 The Classic rooms overlook the relaxing hills or park that surround the Resort. 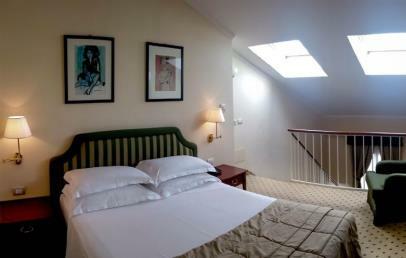 Comfortable double room, more spacious than the Classic rooms. 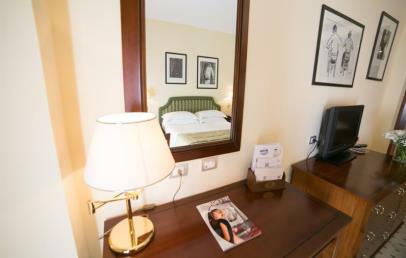 Traditionally furnished, they are equipped with comforts: sofa, writing table and internet connection (LAN and Wi-Fi). 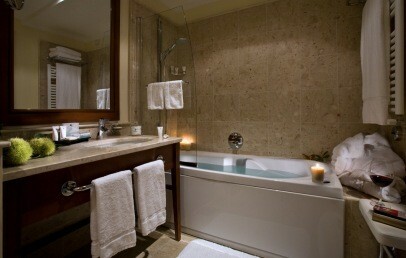 The bathroom has shower or bathtub and hairdryer. 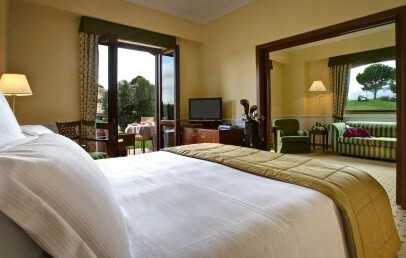 The Deluxe rooms overlook the hills or the park that surround the Resort. Bright rooms distributed over two levels. The double room is located on the mezzanine while downstairs there is a living room with Pay and sat TV, writing table and internet connection (LAN and Wi-Fi). The bathroom has shower or bathtub and hairdryer. They overlook the impressive Mount Etna. 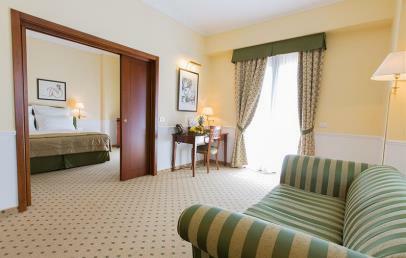 Bright Suite with two separate rooms. One room is the bedroom and the other is a comfotable living room with a desk, TV, internet connection (LAN and Wi-Fi), also ideal for a children room. The bathroom has shower or bathtub and hairdryer. 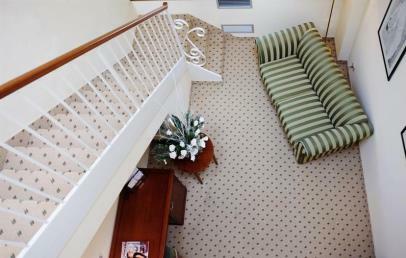 The Suite has a terrace with view on the park. 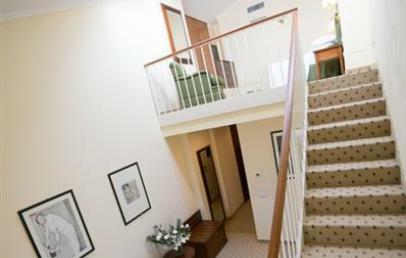 Spacious and comfortable Family Room, traditionally furnished and with internet connection (LAN and Wi-Fi). The bathroom has shower or bathtub and hairdryer. 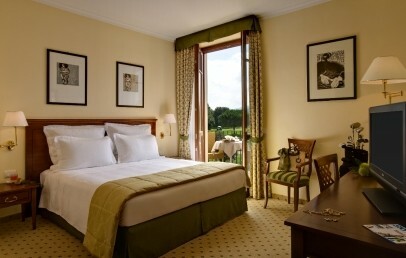 The rooms have a shared balcony, some of them overlooks the park that surrounds the Resort. They can accommodate up to 4 people. -Daily entrance to the SPA with a 1-hour path for adults only: 950 m2 of wellness area with sauna, Turkish bath, whirlpool, water paradise, hydrotherapy pool, relaxation room and herbal tea room. Minors allowed only by reservation for 1 hour on Saturdays from 17 to 20 at the indoor heated pool (located inside the SPA) in case of closure of the outdoor pool. -Children's entertainment from May to mid-October from 9.00 to 13.00 and from 14.00 to 18.00 every day. During the closing time of the outdoor swimming pool, entertainment is offered on Saturday afternoons from 2 p.m. to 6 p.m. and on Sunday mornings from 10 a.m. to 2 p.m. Other dates to be communicated are possible. 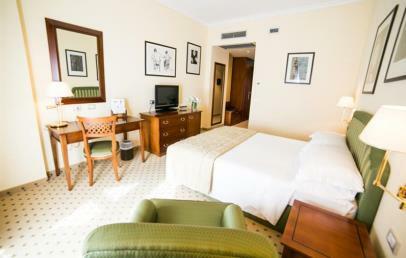 -From 01/06 to 30/09 every 3 days of stay, 1 day of beach service with umbrella and 2 sunbeds at Giardini di Naxos.